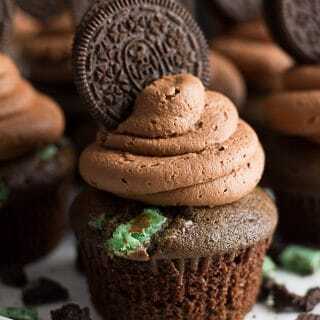 Super moist mint chocolate cupcakes with fluffy chocolate mint frosting and an oreo on top! For all the chocolate mint and oreo lovers out there! Dairy free and vegan. Because sometimes, life requires cupcakes. Need I say more? 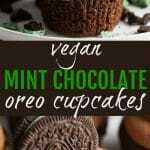 These Vegan Mint Chocolate Oreo Cupcakes are anything but health food, so if that’s what your looking for, make sure to check out my recipes page for ideas. I have a lot of them, but I’m of the mindset that occasionally treats are okay, even if they don’t offer any nutritional value. That’s what this is! I am SUCH a huge lover of all things mint, especially chocolate + mint. I can’t get enough. So with St. Patrick’s Day coming up, I knew I had to come up with some sort of chocolate mint recipe. My kids said a big “YES!” to my cupcake idea, so this recipe was born! I had so much fun making these cupcakes a few weeks ago. I hope you love them! The frosting is made half and half with earth balance and non-hydrogenated vegan shortening. You can use all earth balance if you want. I’m not a big fan of shortening but it makes for really pretty cupcakes, and the frosting will pipe a lot better with it. For a lighter frosting option, use the recipe for Cashew Vanilla Frosting in this recipe, and add a little peppermint extract. If you want to make them really pretty, use pastry bags with different cupcake tips. I literally found a kit on sale for $1.49 at Target a few weeks ago! For the oil in the cupcakes, you can use canola oil, melted earth balance or melted coconut oil. If you use coconut oil, make sure to warm your almond milk slightly. I think these just may be the most delicious cupcakes I’ve ever tasted, so I hope you enjoy them too! 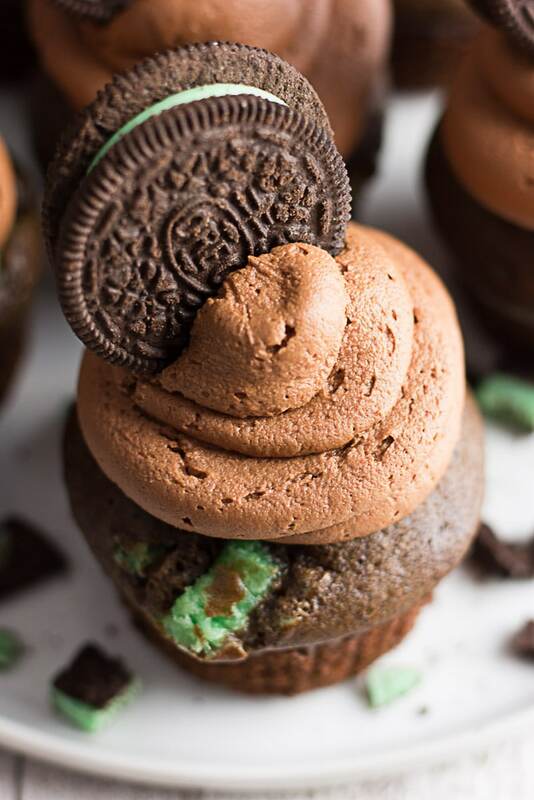 Mint Chocolate Oreo Cupcakes that are dairy free, vegan and totally delectable. Perfect for mint chocolate lovers everywhere! Make these festive cupcakes for St. Patrick's Day or even Christmas. 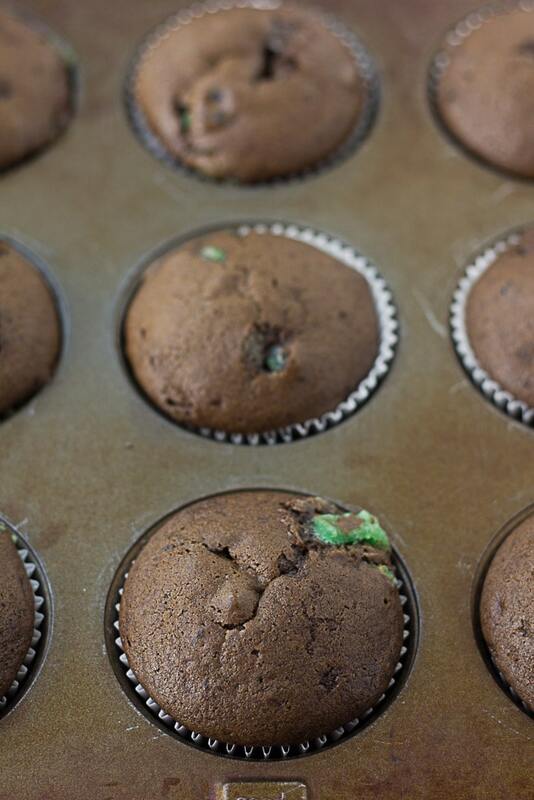 Preheat the oven to 350 degrees F and line a cupcake pan with 12 paper liners. In a large bowl, stir together the almond milk and apple cider vinegar. Set aside for a minute or two to curdle. Now add the oil, sugar, vanilla and peppermint extracts. Whisk to combine. In a separate bowl, sift the flour, cocoa, baking soda and salt. Add the dry mixture to the wet in batches, about 1/3 at a time, and mix well with a wooden spoon, or a handheld mixer (or stand mixer). Gently fold in the chopped up oreo pieces, then pour into prepared cupcake liners evenly. Bake for 20-22 minutes. Cool completely before frosting. With a handheld or stand mixer, beat together the earth balance and vegan shortening on medium speed until light and fluffy. Melt the chocolate chips by putting them in a small bowl and microwaving in 30 second intervals. Stir and set aside to cool. Add the powdered sugar and cocoa powder and beat on low speed, then increase to medium. Add the melted, cooled chocolate chips and extracts and beat. Now add a few tablespoons of almond milk, until you have a thick but pipe-able frosting. 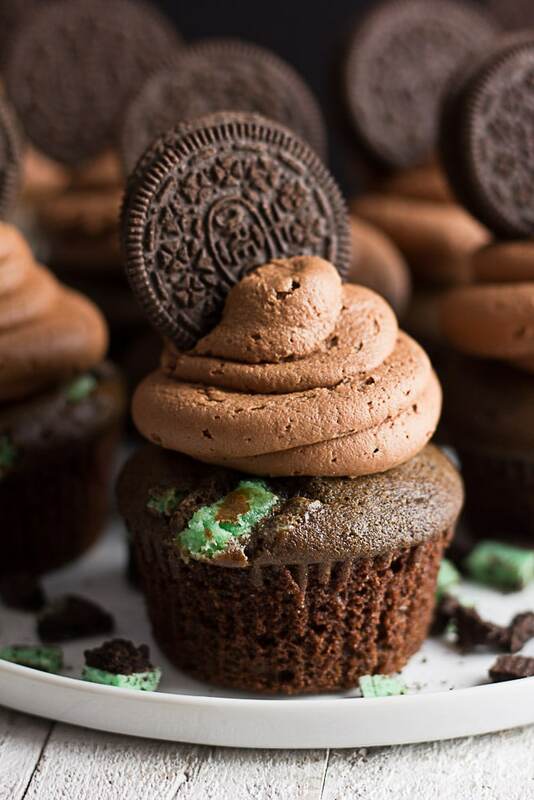 Pipe the frosting onto the cooled cupcakes and top with an oreo cookie. You can use canola oil, melted earth balance spread or melted coconut oil. If using coconut oil, make sure the almond milk isn't too cold, or it will start to solidify when you try to mix it. Try to find non-hydrogenated vegan shortening if possible. Spectrum is a good brand. You can use all earth balance and no shortening if desired, the shortening just makes for prettier, fluffier frosting that holds its shape better. Recipe inspired by The Cake Merchant.